What happens when you take one of the World's most aspirational Italian high fashion houses and one of Italy's most popular car makers? 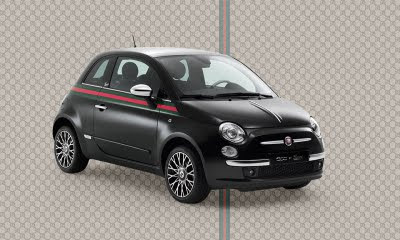 To celebrate both Gucci's 90th anniversary and the 150th anniversary of the unification of Italy, Fiat and Gucci have come together to collabon a limited edition design of the Fiat 500; renaming it '500byGucci'. The ‘500byGucci’ debuted at Milan Fashion Week and was also the focal point in a Geneva based Gucci pop up store back in March. To put it simply, this ride is ill! Interior-wise the car come equipped with Fiat's trademark 'Blue & Me' technology; a system that allows you to combine GPS, Music and hands free calls - all without having to take your hands off the steering wheel. Pair that with a satin chrome exterior in a choice of black or white coupled with Gucci trademark colours and ivory and black interiors, this car is in its own legendary lane. Maybe you are that young and successful individual in the top ten tax bracket who wants to purchase yourself that gift to validate your success? Maybe you are that club promoter that wants to pull up to your event with a touch of class? You can just picture yourself throwing your leather duffel bag in the trunk, with your fashion game on lock and being all set! Being ‘that guy to watch’ in your circle. With a Price Tag of £15,000 $21,000 this limited edition fantasy can become a reality. I personally like nice things, but rather than read my thoughts on it, why not hop along to the interactive sites (UK)/ (INTERNATIONAL) to peep it for yourself and to register for updates?